Maia and Nico are best friends, and of course they do what best friends do: they share, and play, and laugh. Everything is better when they are together. Now you can understand why Maia is so shocked when she knows Nico and his family are moving away for a few months due to his father studies. How will she survive? At the beginning it was really, really hard. Maia only could feel a big emptiness. Time seemed to move so slowly. But after some time she dared to try, and a new pet appeared. Then a new friend. Even piano lessons. Maia feels much happier now, and she loves to share all of this with Nico by phone. And finally the great day is here. Nico will be back at any moment. Will Maia have time enough to play with him now that her life is so full of new things? But as soon as she sees Nico she knows. She just knows. Nico's place in her heart is intact. 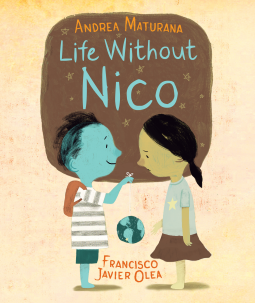 Beautiful story to help kids make sense of normal feelings we all have when things unexpectedly change. Maia learns to make the best of the situation she has to go through. It's a very encouraging story. The pictures are lovely and sweet.